Because of the horses' high level of natural anatomic articulation their personalities come alive through a myriad of possible positions, poses, and expressions. Changes range from standing to laying down, or even as if rolling for a dust bath on a summer day. With the custom brass stand, the range of poses and expressions is enhanced dramatically. The photo below demonstrates a position reminiscent of a classic painting "Whistlejacket", portrait of a race horse. We are committed to using natural, sustainable materials. 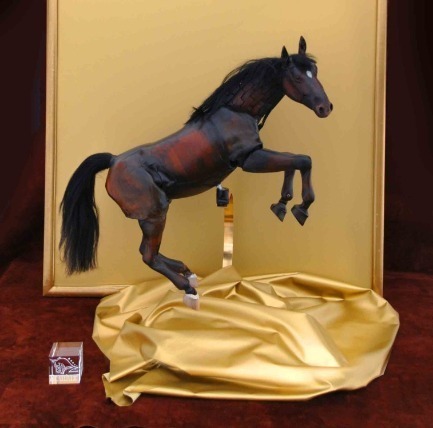 All our horses are made from the finest American cherry and bass wood, cow leather, combined with elements of brass, and copper. Linseed based oils and natural pigment paints form our main color palette. Because of the horses' high level of natural anatomic articulation their personality comes alive through a myriad of possible positions, poses, and expressions. With a quick change of the ears and braiding or binding up of the mane and tail additional expressions are possible such as the pose pictured here, resembling a polo pony. 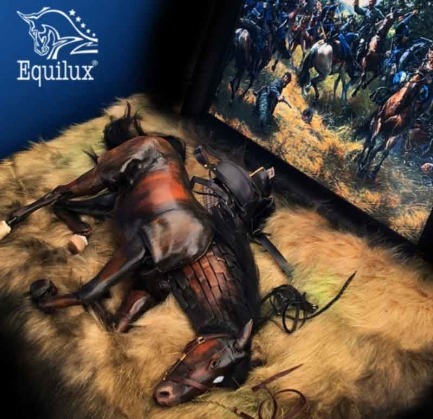 Colors vary from all the brown, black, and white shades of horses' natural color to an imaginative deep celestial blue, All horses are painted in oil color and finishes with a satin sheen. 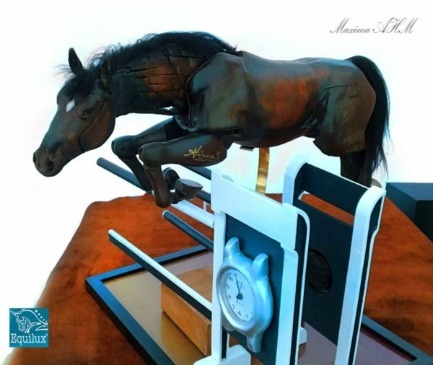 Blue Horse is an expressive smaller sculpture with great personality. This hand carved sculpture forms the basis of all other versions. 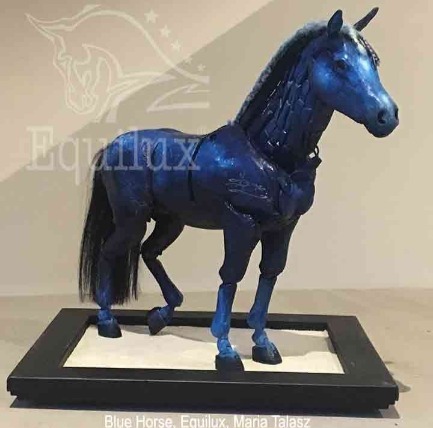 Blue is carved from fine cherry wood combined with leather, sheepskin and wool braided mane, real horse hair tail, and is adorned with several small jay feathers. 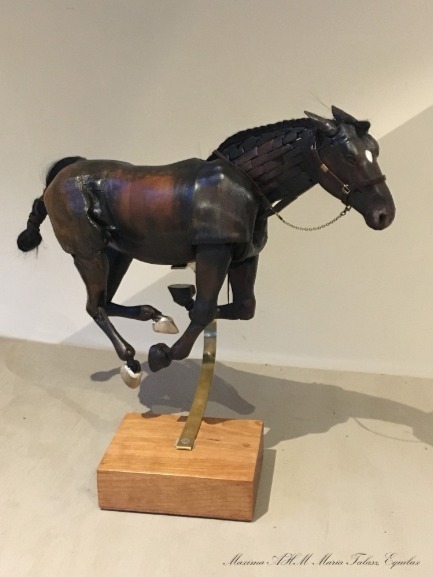 Look for a new series of horses in 2019! 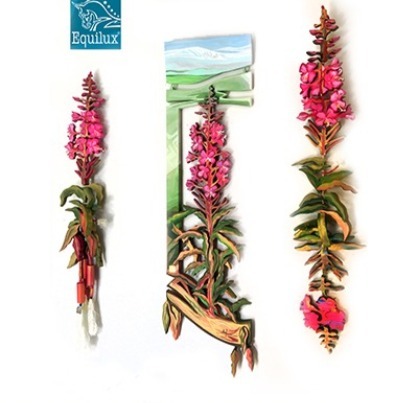 This iconic Alaskan flower is front and center in the Alaskan Arctic Light collection. In the Symphony Series variations on the theme makes our short summers last throughout the winter.